Will El Paso High be given the money that they are not spending over at UTEP? This entry was posted on Wednesday, April 17th, 2019 at 5:00 AM and is filed under El Paso Independent School District. You can follow any responses to this entry through the RSS 2.0 feed. You can leave a response, or trackback from your own site. I don’t believe EPISD is the only school district that has been using the Haskins Center. Franklin HS has close to 700 graduates. It would be a real squeeze to fit them, and a limited supply of guests into our large gym. They could use their brand new stadium. It is more upsetting to me that counselors are being forced to work on Memorial Day without extra pay. I think that it’s debatable wether or not the money spent to hold the ceremonies at UTEP is a worth the price. 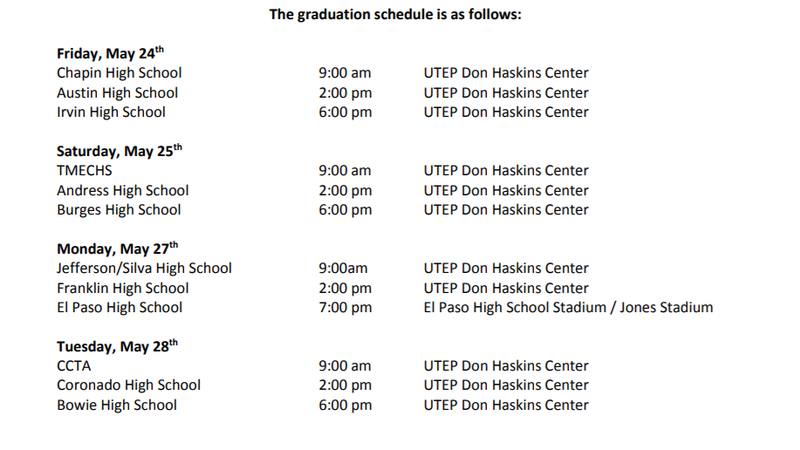 Every school, not just El Paso High, has a gym or stadium that could be used for a graduation ceremony. Parking shouldn’t be an issue because surely the schools can accommodate the parking needs created by a full stadium (not even EPISD builds stadiums with our parking); commencement is just another event these venues could host. Air conditioning is poor, very poor, at some schools, but then again with $670 million on hand they could fix the broken HVACs. So why is UTEP used? I guess the real convenience of using UTEP rests with the administrative leadership team that has to attend the ceremonies. We wouldn’t want to make them have to drive all around town going from school to school. It’s easier for them to just camp out at UTEP all day. Superintendent Juan Cabrera has not been attending graduation ceremonies the last few years, so he doesn’t really factor into the equation at all. His lack of attendance at commencement ceremonies would be excellent fodder for another discussion. I personally think it would be good leadership to be seen at every graduation with a huge smile; J.C. probably can’t stay sober for that long.